In 2010, the rate of meeting physical activity guidelines for adults with advanced education degrees was more than 4 times the rate for persons with less than a high school education. In 2001–04, college graduates on average consumed 1 cup of vegetables per day, whereas persons with less than a high school education consumed 20% less. In 2010, the rate of meeting physical activity guidelines for males was about 1.5 times that for females. Reduce the proportion of adults who are obese. 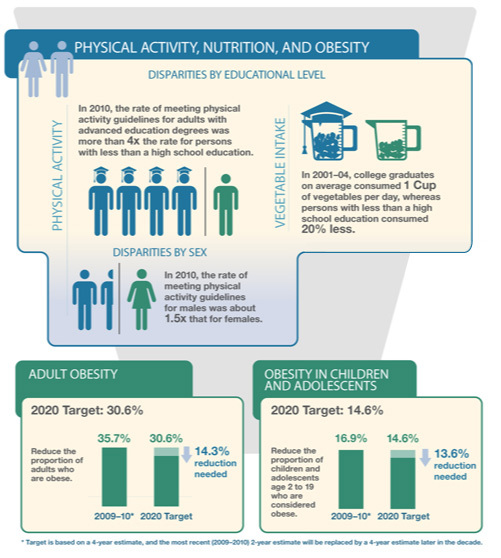 Reduce the proportion of children and adolescents age 2 to 19 who are considered obese.